Considering that Pantai Kelanang is one of the closest beaches to Kuala Lumpur it is not that well known and less visited than its near neighbour, Morib Beach. Kelanang is not your idyllic tropical beach but it is a laid back and relaxing place to enjoy fresh sea breezes and feel sand between your toes, even if the sand is of the brown and muddy variety. 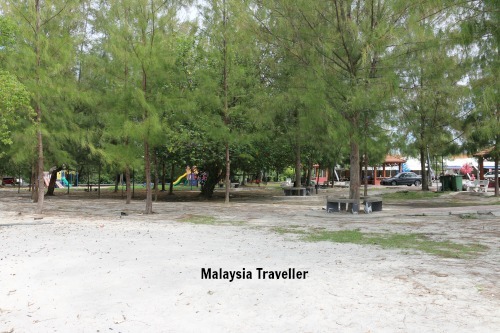 The coastline here, 7km away from Morib, is fringed with pine trees (casuarina) and mangroves. The trees provide good shady spots for picnics and camping. The beach gets popular at weekends but if you go on a weekday outside of the school holidays you might find you have the place to yourself. The downside of going on a weekday is that the facilities such as toilets might be padlocked and the food stalls and beach item shops may not be open. The beach is protected from erosion by a barrier of giant sand bags which form a kind of lagoon when the tide is right. Fishermen were casting nets beyond the sand bags while others were scratching the sand for shell fish such as bamboo clams which are common in this area. The sea is a rather murky brown colour but on my visit it seemed to be reasonably free of litter and obvious pollution. 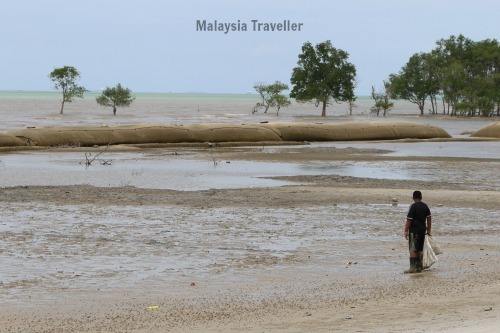 It is natural for the coastline on this stretch of the Strait of Malacca to be brown as the mouth of the Langat River disgorges its constant flow of silt just 2 km away, while the busy port of Klang (and the heavily polluted Klang River!) 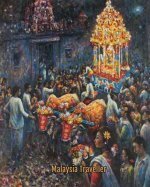 is also not far away. 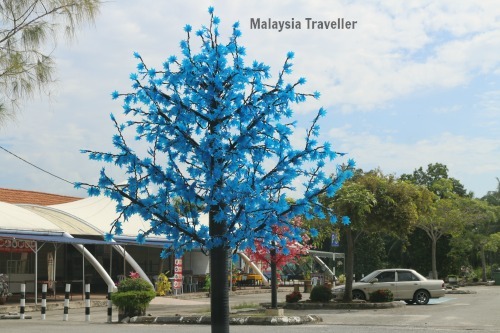 There is a large car park in front of the beach which is decorated with LED illuminated artificial trees in various bright colours which must look nice in the evenings. Swimming or paddling. (There is a life guard station here but also a no swimming sign in one area so take care). Drivers should head for Banting (Selangor) and then follow the signs for Morib Beach. 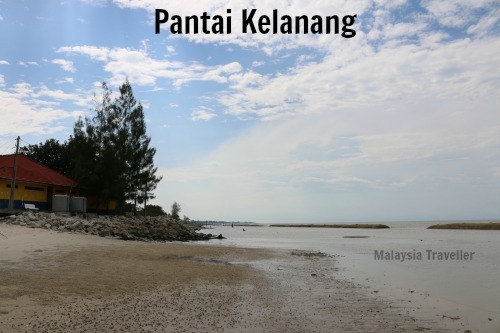 As you get close to Morib you will see signs for Kelanang Beach. There are some hotels at nearby Morib Beach. 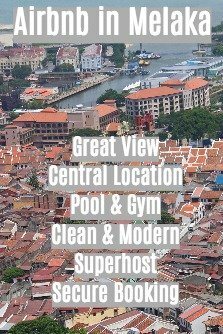 You can search for availability at discounted room rates on Agoda’s website.